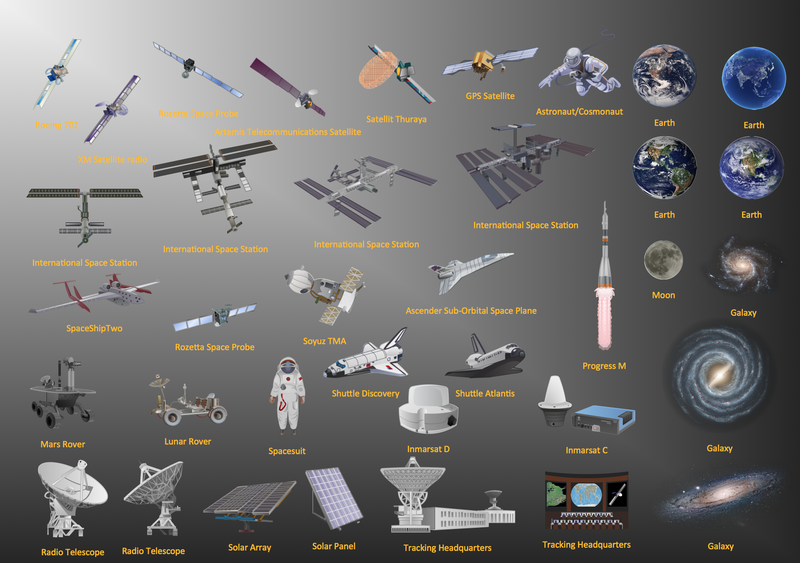 The vector stencils library Aerospace contains clipart of space objects and vehicles, satellites, space probes, International Space Station, space shuttles, rockets, telescopes, planets and galaxies for ConceptDraw DIAGRAM diagramming and vector drawing software. Use it to draw spacecraft illustrations on space communications, earth observation, meteorology, navigation, planetary exploration. The vector stencils library Aircraft contains clipart of aerospace objects, transportation vehicles, office buildings, and ancillary facilities for ConceptDraw DIAGRAM v12 diagramming and vector drawing software.